Figure 1. 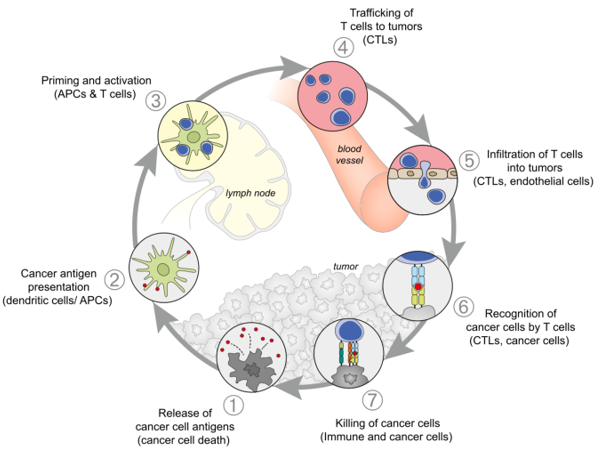 The cancer-immunity cycle steps with dendritic and T-cells playing the major role in killing cancer cells (Chen and Mellman, 2013). aid tumours evade the immune mechanism. However, numerous promising therapies have been developed at clinical and preclinical level, promoting either the enhancement of T-cell activation signals or blocking the suppressor signals. Head and neck squamous cell carcinomas have been the target for several immune-based therapeutic approaches. Introducing tumour antigens and activating a cytotoxic CD8 T-cell response with therapeutic vaccines is a treatment under investigation with minimal to moderate success so far in head and neck cancer (Wang et al., 2018). Adoptive cell therapy, which involves ex-vivo selection and engineering of T-cells to chimeric antigen receptor (CAR) T-cells for high tumour specificity and reintroduction to the patient, is currently being tested on a phase II clinical trial for head and neck cancer (Iovance Biotherapeutics, 2018). Immune checkpoint inhibitors are finally the only recently approved immuno-oncological agents on the treatment landscape for head and neck cancer (U.S. Food and Drug administration, 2016; NICE, 2018). Activated T-cells have the ability to recognise and subsequently kill cancer cells during long-term antigen exposure. This phase is called the effector phase (Fig. 1, step 6) and it is now clear that tumours have the ability to escape this mechanism by expressing ligands for T-cell–suppressive immune-checkpoint receptors, which results in negative regulation (Pardoll, 2012). Checkpoint inhibitors are IgG4 monoclonal antibodies which act either by blocking the T-cell receptors, programmed death 1 (PD-1), or by blocking the tumour ligands, programmed death-ligand 1 (PD-L1) (Fig. 2). Nivolumab is a fully human monoclonal antibody, inhibitor of the PD-1 immune-checkpoint pathway, which is approved as monotherapy for metastatic or recurrent head and neck cancer refractory to platinum-based chemotherapy. Data on nivolumab for this patient category came from the CheckMate-141 study, an open-label, randomised phase III clinical trial, which compared this novel medicine with investigator’s choice therapy (ClinicalTrials.gov, 2014b). Patients who received nivolumab had a longer median overall survival (OS), 7.5 months (95% confidence interval [CI], 5.5-9.1), versus conventional chemotherapy, 5.1 months (95% CI, 4.0-6.0), a benefit in quality of life and a lower incidence of treatment-related adverse events (grade 3–4: nivolumab 13.1% vs chemotherapy 35%) over investigator’s choice chemotherapy (Fig. 3). Patients with tumours expressing protein PD-L1 ³1% who received nivolumab had 30% less hazard for death compared with patients who received standard chemotherapy (Fig. 4). In the subgroup analysis of HPV status, patients on the nivolumab group had improved objective response rate (ORR) compared with standard chemotherapy in both HPV positive and negative subgroups (Ferris et al., 2018). 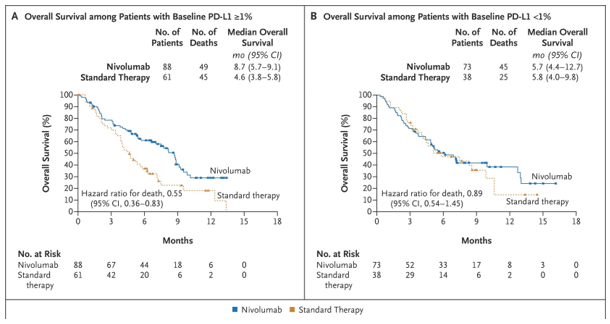 Nivolumab, however, did not improve significantly the progression free survival, which was reported as 2.0 months for nivolumab and 2.3 months for investigator’s choice therapy (hazard ratio [HR]=0.87, p=0.26) (Fig. 3, B). Moreover, patients on the nivolumab arm experienced some serious drug-related adverse events, with the most frequent being fatigue, nausea, rash, decreased appetite, and pruritus, which are fewer than conventional therapy. Five cases of pneumonitis were reported with nivolumab, one of which resulted in death due to pulmonary embolism (Ferris et al., 2016). Nivolumab group outperformed the standard therapy group in patient-reported quality of life and symptom burden(Harrington et al., 2017). Figure 2. Blockade of PD-1 or PD-L1 with monoclonal antibodies negates negative regulation and preferentially activates T-cells with specificity for the cancer (Ribas, 2012). Figure 3. Overall Survival, Progression-free Survival, and Treatment Effect on Overall Survival According to Subgroup (Ferris et al., 2016). Pembrolizumab is another anti-PD1 humanized IgG4 monoclonal antibody approved only in the U.S. as second line therapy for recurrent or metastatic head and neck cancer. This drug was tested with the KEYNOTE-040 study, an open label, randomized, phase III clinical trial, which compared the efficacy of pembrolizumab versus investigator’s choice standard treatment for platin-refractory metastatic or recurrent head and neck cancer (ClinicalTrials.gov, 2014a). The findings of this study revealed that the hazard ratio for death on the pembrolizumab group versus the investigator’s choice standard of care was 0.81 (95% CI: 0.66-0.99) with comparable progression free survival between the two groups (Cohen et al., 2017). However, 12.5% from the standard of care group crossed over to the immunotherapy group when they developed progression of disease, which may have confounded the results in favour of the standard of care group (Fig. 5). 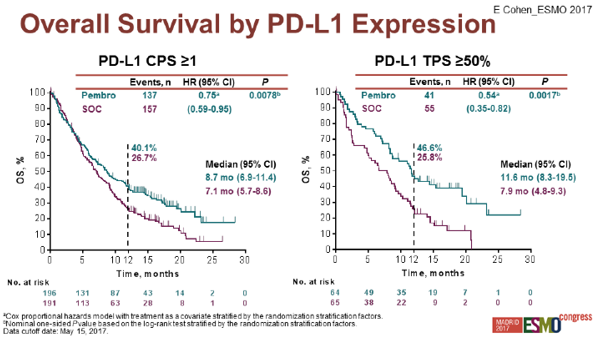 In the subgroup analysis according to PD-L1 tumour expression, pembrolizumab seems to offer greater benefit in survival to patients with PD-L1 expressing tumours (HR=0.54 [95% CI: 0.35-0.82]), which could support its administration in this particular population (Fig.6). Figure 5. Overall survival in the intention to treat population in the KEYNOTE-040 study (Cohen et al., 2017). Figure 6. Overall survival by PD-L1 expression in the KEYNOTE-040 study (Cohen et al., 2017). The results from these studies are quite encouraging, however we are still far from achieving a satisfactory result in this patient population. Combination of immuno-oncological agents which act at different checkpoint pathways could be a potential solution to this unmet clinical need. Currently, there are several ongoing clinical trials testing combination schemes of immuno-oncological agents or an immuno-oncological agent combined with standard chemotherapy. Moreover, there are preliminary data which support the use of these agents in the neoadjuvant setting (Uppaluri et al., 2017). Nivolumab and pembrolizumab are being currently tested as frontline, neoadjuvant and adjuvant treatment for recurrent/metastatic HNSCC or locally advanced HNSCC in phase I/II clinical trials (Cavalieri et al., 2018). There is a strong biological rationale for developing immunotherapies in head and neck cancer. The first positive results which led to approval of nivolumab and pembrolizumab involved recurrent or metastatic platinum-resistant disease. There is significant clinical trial activity in multiple settings in the treatment landscape. Results from the ongoing studies are anticipated to elucidate whether these treatments could improve the outcomes for head and neck cancer patients. Patient selection according to tumour biomarkers will play a key role in guiding patient selection. Immune-related adverse events, like diarrhoea, pneumonitis and endocrine autoimmune disease is a concern that needs to be addressed and assessed in respect to the potential benefit offered. The cost-effectiveness of these treatments should be carefully estimated before being recommended for routine use in the national healthcare systems. Cavalieri, S. et al. (2018) ‘Immuno-oncology in head and neck squamous cell cancers: News from clinical trials, emerging predictive factors and unmet needs’, Cancer Treatment Reviews, 65, pp. 78–86. doi: https://doi.org/10.1016/j.ctrv.2018.03.003. Chen, D. S. and Mellman, I. (2013) ‘Oncology Meets Immunology: The Cancer-Immunity Cycle’, Immunity. Elsevier, 39(1), pp. 1–10. doi: 10.1016/j.immuni.2013.07.012. ClinicalTrials.gov (2014a) Pembrolizumab (MK-3475) Versus Standard Treatment for Recurrent or Metastatic Head and Neck Cancer (MK-3475-040/KEYNOTE-040). doi: NCT02252042. ClinicalTrials.gov (2014b) Trial of Nivolumab vs Therapy of Investigator’s Choice in Recurrent or Metastatic Head and Neck Carcinoma (CheckMate 141). doi: NCT02105636. Cohen, E. E. et al. 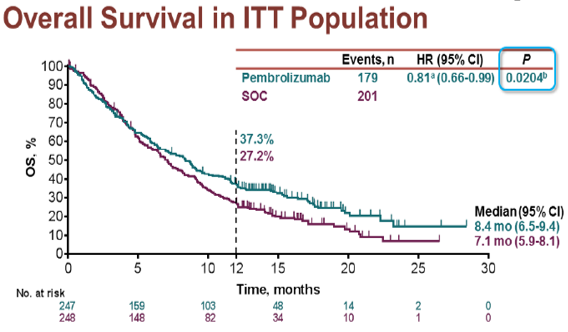 (2017) ‘LBA45_PRPembrolizumab (pembro) vs standard of care (SOC) for recurrent or metastatic head and neck squamous cell carcinoma (R/M HNSCC): Phase 3 KEYNOTE-040 trial’, Annals of Oncology, 28(suppl_5), p. mdx440.040-mdx440.040. Available at: http://dx.doi.org/10.1093/annonc/mdx440.040. Ferris, R. L. et al. (2016) ‘Nivolumab for Recurrent Squamous-Cell Carcinoma of the Head and Neck.’, The New England journal of medicine. United States, 375(19), pp. 1856–1867. doi: 10.1056/NEJMoa1602252. Ferris, R. L. et al. (2018) ‘Nivolumab vs investigator’s choice in recurrent or metastatic squamous cell carcinoma of the head and neck: 2-year long-term survival update of CheckMate 141 with analyses by tumor PD-L1 expression.’, Oral oncology. England, 81, pp. 45–51. doi: 10.1016/j.oraloncology.2018.04.008. Finn, O. J. (2018) ‘A Believer’s Overview of Cancer Immunosurveillance and Immunotherapy.’, Journal of immunology (Baltimore, Md. : 1950). United States, 200(2), pp. 385–391. doi: 10.4049/jimmunol.1701302. Harrington, K. J. et al. 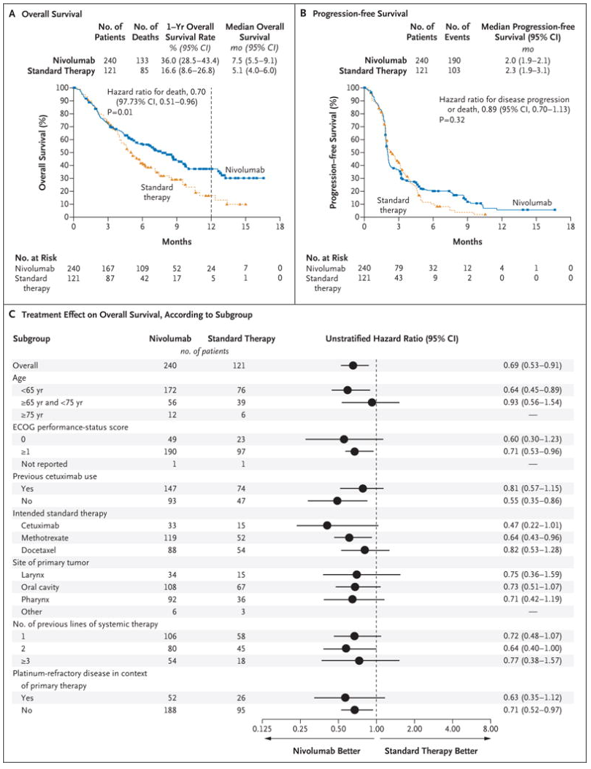 (2017) ‘Nivolumab versus standard, single-agent therapy of investigator’s choice in recurrent or metastatic squamous cell carcinoma of the head and neck (CheckMate 141): health-related quality-of-life results from a randomised, phase 3 trial’, The Lancet Oncology. Elsevier, 18(8), pp. 1104–1115. doi: 10.1016/S1470-2045(17)30421-7. Iovance Biotherapeutics, I. (2018) Study of LN-145 Autologous Tumor Infiltrating Lymphocytes in the Treatment of Squamous Cell Carcinoma of the Head & Neck, ClinicalTrials.gov. Available at: https://clinicaltrials.gov/ct2/show/NCT03083873 (Accessed: 20 September 2018). NICE (2018) Nivolumab for treating squamous cell carcinoma of the head and neck after platinum-based chemotherapy. Available at: https://www.nice.org.uk/guidance/ta490 (Accessed: 22 September 2018). 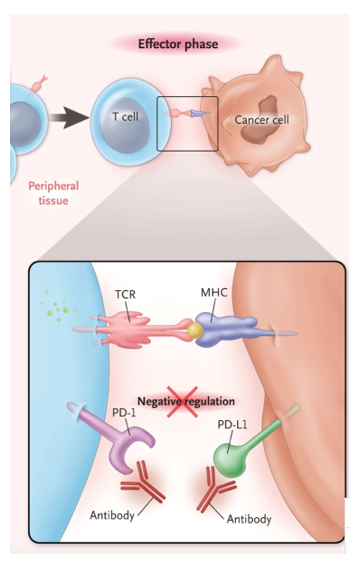 Pardoll, D. M. (2012) ‘The blockade of immune checkpoints in cancer immunotherapy.’, Nature reviews. Cancer. England, 12(4), pp. 252–264. doi: 10.1038/nrc3239. Ribas, A. (2012) ‘Tumor immunotherapy directed at PD-1.’, The New England journal of medicine. United States, pp. 2517–2519. doi: 10.1056/NEJMe1205943. U.S. Food and Drug administration (2016) pembrolizumab (KEYTRUDA). Uppaluri, R. et al. (2017) ‘Neoadjuvant pembrolizumab in surgically resectable, locally advanced HPV negative head and neck squamous cell carcinoma (HNSCC).’, Journal of Clinical Oncology. American Society of Clinical Oncology, 35(15_suppl), p. 6012. doi: 10.1200/JCO.2017.35.15_suppl.6012. Wang, C. et al. (2018) ‘Targeting Head and Neck Cancer by Vaccination’, Frontiers in Immunology. Frontiers Media S.A., 9, p. 830. doi: 10.3389/fimmu.2018.00830.